We utilize different vegetables to suit our taste and serve it with an absolutely delicious Cashew Dip to keep it both healthy and vegan. Any vase that is broad enough at the top to accommodate your Cabbage Bowl and Veggies will do nicely. If you don't have one you like, go ahead and use a large bowl. You don't want it too wide or the bouquet effect will be lost and it will look crowded. Optional: Parboil the carrots for 2-5 minutes to slightly soften, then immerse immediately in ice water to stop the cooking. Or, any vegetables that you like. Just keep the overall finished design in mind when you choose them. Carefully peel back the outer leaves. With a very sharp knife cut a circle in the top of the cabbage and begin hollowing the center out. You can use a melon baller or just use your knife and gently cut and pull until you have a circular empty space in the middle that resembles a bowl. Wash them thoroughly (we recommend using a fruit/vegetable wash). Pat them dry gently. With a sharp knife cut them into strips so that you can grab a bunch in your hand. Keep them somewhat uniform in length will help you achieve a more professional look. Remember to keep them grouped with the same vegetables together. 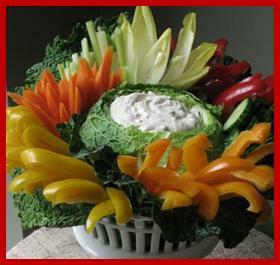 Fill the Cabbage Bowl with the dip of your choice. We strongly recommend keeping it healthy and LOVE our Cashew Dip. You ARE the Everyday Gourmet!